Very Fishy...And That's Very Good! 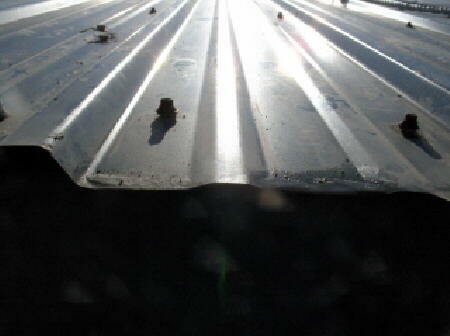 Next came word that the studio roof is in serious need of expensive repair (please see page 3). Then, on June 1, the ten-computer system which records and plays back audio for all of our studios catastrophically failed beyond repair. It was over six years old, which is venerable for workhorse computers. We were saving to replace it, hoping it would last another few months. Thanks to creativity and hard work by the staff, most of our listeners couldn’t tell. Within a week, a new system was installed and in place, at a sudden cost of $59,396. You can imagine what a difficult period this has been for us. We really can use a bit of extra help right now. Thank you so much for your helping hand and your prayers for our mission. We repeat: You are our greatest strength. You, your intentions and those you love remain in our constant prayers. SCREENING: (left) General manager Ric Schmidt checks upcoming events on one of the Studio A computer screens during his live morning show. 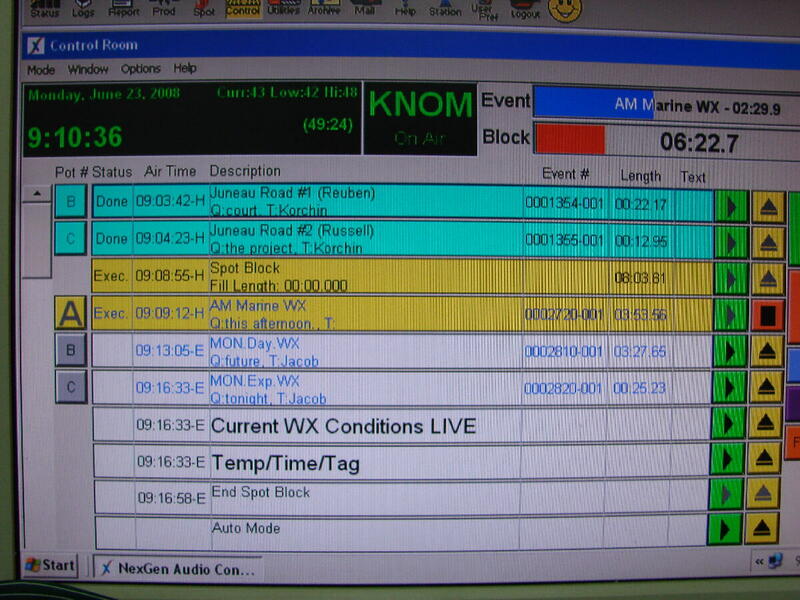 The computer system controls four studios and three audio recording and editing stations, and it keeps KNOM on the air, unattended, overnights. While its cost is high, we think of it as seven employees who are willing to work 24 hours a day for $1.31 an hour without benefits or vacations. 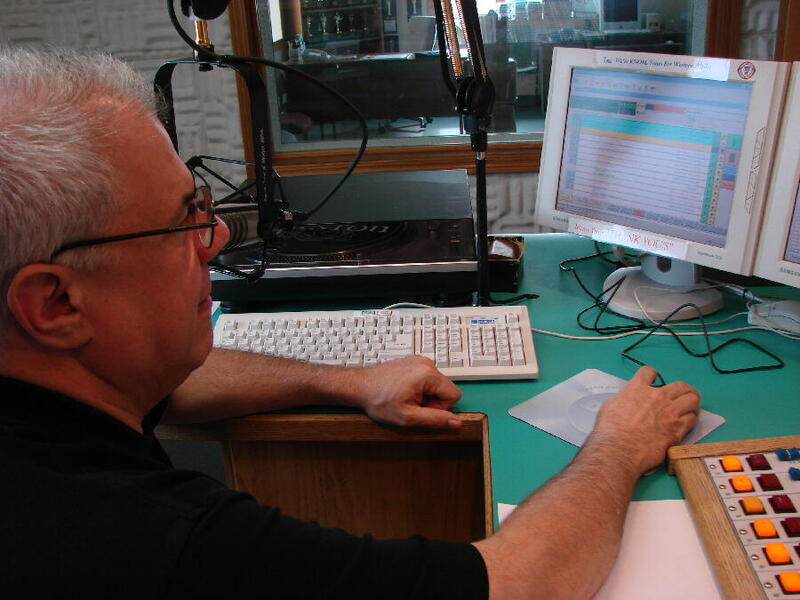 KNOM is the oldest Catholic radio station in the United States and by far, the most award-winning, thanks to you and other good and caring people like you. INSPIRATIONAL SPOT: When life is going well, it’s easy to think our successes are because of something we’ve done. But what happens when things aren’t going that great? We can become discouraged. We can even blame others for our troubles. God promises that through faith in Jesus Christ, we can stand firm on steady ground, keeping priorities straight. With God at the top of the priority list. SCREENING: (left) Here’s the computer screen Ric is viewing, as the computer is playing a sequence of audio files. PRAYER REQUEST: Many of our benefactors have written this past month, requesting prayers for family and other loved ones who have recently died, or who are experiencing special difficulties in their lives right now. Please join us in prayer for these wonderful people, who, together with you, make our mission possible. RECRUITING: We continue to recruit for volunteers for 2008-2009. For a young person who is qualified, it’s a wonderful introduction to all of the aspects of radio broadcasting in a friendly, nurturing environment. Our volunteers are given training and responsibilities that are far more extensive than they would find elsewhere. If you know a young person who might benefit from a year or more at KNOM, please have them e-mail belong@knom.org. Thank you! HAT’S IN THE RING! In June, we learned that KNOM is one of five stations nominated for a National Association of Broadcasters “Marconi Religious Station of the Year” Award! The winner will be announced September 18th in Austin, Texas. If you walk into our front office, you’ll see two Marconis, from 1992 and 2003. Can you feel our excitement? OUR PLEDGE TO YOU: We are sincerely grateful for your sacrifices which make our mission signal possible. We promise that we will prayerfully exercise the best stewardship possible with the gifts that you so generously provide for our work. And we renew our longstanding promise that we will never give out your name and address to anyone. INSPIRATIONAL SPOT: If God seems distant to you. . .who moved? INSPIRATIONAL SPOT: Cut up a feather pillow and scatter the feathers in the wind. Now try to collect the feathers. Even though one may be truly sorry for the harm caused by gossip, it is just as impossible to repair the damage done by words as it is to recover those feathers. We’d be better off not spreading it in the first place. A QUESTION OF “WHETHER:” June 11th, Nome awoke to 2.4 inches of snow. That’s unusual, and not far from the June record, 4 inches of snow on June 4, 1924. Two days later, Nome was 62�, achieving the town’s highest temperature since last August 27th. THE FOLLOWING DAY, Nome slid back into the more usual summer 30s and 40s. Air cooled by sea ice blanketed the coast with persistent dense fog that shut down the airport for days. Hundreds of passengers, including KNOM’s Tom Busch and Les Brown, were aboard planes from Anchorage that flew 539 miles and made aborted approaches to the runway before turning back. Hundreds of others couldn’t leave Nome, like outgoing volunteer Kristina Proctor, who spent five days trying to return home, general manager Ric Schmidt, whom the fog prevented from joining a board meeting of the Alaska Broadcasters Association, and program director Kelly Brabec whom the weather kept from attending her sister’s wedding. 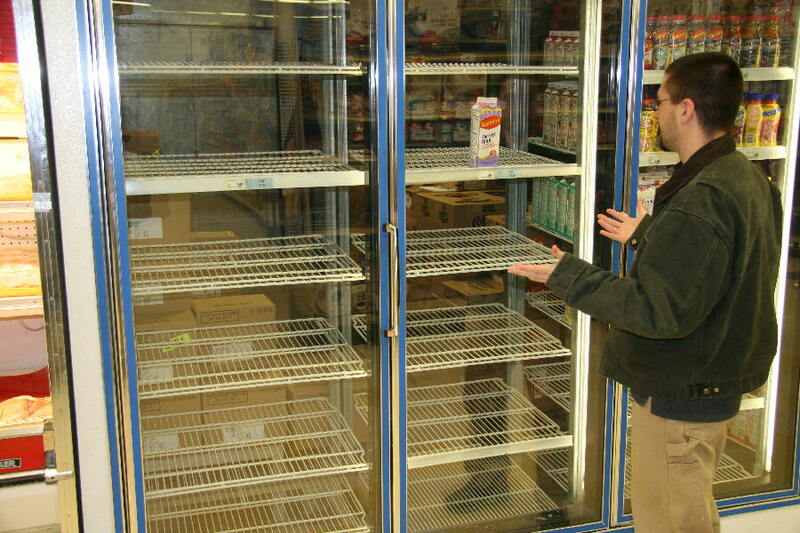 (Left) KNOM volunteer Jacob Buckenmeyer notes that since all of Nome’s groceries arrive by air, store shelves, like this milk cooler, emptied until planes were able to make it in. A SCREW LOOSE? (Left) You can imagine our horror when we discovered that 40% of the screws holding down the studio building’s sheet metal roof have loosened in the wind, putting the roofing in mortal danger. A 5-year fix will cost about $9,200. A 20-year-fix will cost $26,900. Ouch! Our new buildings in 1992 and 1993 have saved us millions of dollars in the intervening years, but they need touch-ups, and we sincerely thank you for your help keeping them alive and well. Thank you! INSPIRATIONAL SPOT: God does not love us because we’re valuable. We’re valuable because God loves us. THIRTY YEARS AGO: July 14, 1978 sees a spectacular stunt for KNOM’s 7th anniversary. Volunteer engineer Mark Hoelsken is noted for his unusual remote broadcasts. This afternoon, he deejays the afternoon show live from Sledge Island, an uninhabited chunk of rock and tundra 23 miles west of Nome. He’s ferried by King Island Eskimo Dean Pushruk in a traditional boat made of driftwood covered with tightly sewn walrus skins. Fellow volunteers Joanne Ambrosi and Colleen Harrington are on board, and a small Munz Northern Airlines bush plane buzzes the group, with volunteer Chris Robling aboard, also broadcasting live. 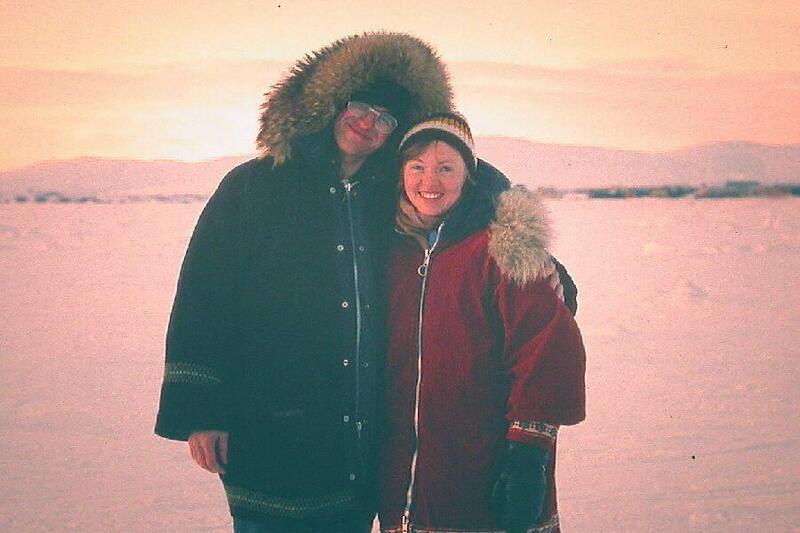 (Left) Volunteer Mark Hoelsken poses on the tundra with volunteer support nurse Kate Lawless, RN, in spring 1976. In KNOM’s early years, 90% of its income was gifts from nurses like Kate, as well as a few doctors, who worked for Nome’s hospital, lived as volunteers and donated their entire salaries to the mission. FORTY YEARS AGO: July 8, 1968, Alaska pioneer broadcaster Augie Hiebert is in Washington, DC, meeting with the future Nome Catholic station’s pro bono attorney Joe Hennessey, and pro bono consulting engineer John Mullaney. That day, Nome sets an all-time high temperature record of 86�, thoroughly wilting residents, who are more accustomed to summer temperatures in the 30s and 40s. VERY FISHY. AND THAT’S VERY GOOD! Twice a day during the summer, every person who fishes across this vast area, whether commercially or to put food on the table — and in many villages that’s someone in every home — glues their ears to KNOM. The program is a fishery report, in which Alaska State Fish and Game biologists announce when the various kinds of fishing are permitted and where, usually for very short periods. For listeners in remote summer fish camps, KNOM provides their only way of learning when they are allowed to fish. Spreading this vital information is one of many, many ways in which your gifts are helping families every day. Thank you! THE WORK CONTINUES: Our strong and greatly appreciated signal beams throughout 100,000 square miles of rugged western Alaska, with education, encouragement, positive companionship, information and inspiration, 24 hours a day. In some villages, every adult is a daily listener. We have more to tell you, but we’re out of space. Please tune in next month, won’t you? Once more, we thank you from the very bottoms of our hearts for your kindness in helping us serve educational and spiritual needs in this remote region. May God bless you abundantly!